The Honda Odyssey got a makeover in 2018 making it better than ever, confirming its position as one of the top minivans on the market. In its 5th generation, the Honda Odyssey Touring offers more power (280 HP, 3.5L V6 engine), an all new 10-speed automatic transmission, amazing communication tools (e.g. CabinTalk allows you to talk to your kids - through their headphones - while they're watching a movie), and thoughtful details such as a wireless phone charger and built-in vacuum for inevitable Goldfish cracker spills. Note: The Touring edition is the top trim for the Honda Odyssey. Five other trims are available. Chrome accents, curves on the side panels, a mini spoiler, and 19-inch aluminum alloy wheels make the Honda Odyssey pretty appealing - for a minivan. It has some style, but isn't trying too hard. When I climb inside, however, I start to truly appreciate this spacious vehicle and all its features. The leather seats are comfy and with eight seats in total, we can bring a whole 'nother family hiking! As the kids explore the back - "There's a TV! Mom, did you know there's a vaccuum? There are so many cupholders! (15 in fact)" - I adjust the seat, mirrors and steering wheel and sync my phone. No need using my wi-fi if I can use the van's (complimentary AT&T wi-fi hotspot trial comes with vehicle)! I find some tunes on Sirius XM radio, then hit the road. We put 750 km on the Honda Odyssey over one week. From gravel roads to winding mountain highways, we were very pleased with how it handled. Despite its large size (5.2 m / 17 feet long), it drove quite similar to my Honda CRV. Having more power than we're used to also made for a better driving experience. I was never stuck behind a slow moving vehicle for lack of passing power. According to caranddriver.com, the 2018 Honda Odyssey can go from 0-60 mph (96.6 km/hr) in 6.6 seconds. Pretty impressive - and surprisingly better than many mid-sized SUVs! This is achieved thanks to a 3.5L V6 engine with 280 horsepower and 262 lb-ft of torque. The 10-speed automatic transmission was smooth in normal driving, ECO mode, and cruise control. For those who are used to driving standard, you can play around with the paddle shifters on the steering wheel. Honda Sensing safety technology is now standard on ALL Honda Odysseys and includes: Adaptive Cruise Control, Lane Keeping Assist System, Road Departure Mitigation, Forward Collision Warning, Lane Departure Warning, and Collision Mitigation Braking System. The Touring edition also has a Blind Spot Information System (BLIS). My favorite feature for highway driving is Adaptive Cruise Control. Simply set the speed and gap between vehicles in front of you, and the car automatically slows down when you catch up to a slow moving car, then resumes cruising speed when you pass. Last but not least, we loved how quiet it was in the cabin! The acoustic windshield, and acoustic front and rear door glass cancels out most road and engine noise for an almost silent ride in the city. We only noticed road noise when it was really windy, or when we had stand-up paddleboards on the roof. The combined mileage works out to 696 km on one 73.8 L tank of gas. Since we did mostly highway driving, we got 750 km out of less than one tank of gas. Pretty awesome considering the size of the van and the fact that we had it loaded with four people, four bikes, camping gear, and two standup paddleboards! With a variety of seating configurations, massive cargo space, and thoughtful storage compartments, it's easy to pack for long road trips. On our camping trip to south Kananaskis, we folded the 3rd row of seats down, removed the middle seat in the second row, loaded all our gear in the trunk and still had room to spare. We popped the cooler between the kids' seats so they could help themselves to drinks and snacks. No roofbox required, no bags stuffed around the passengers' feet, and we could still see out the back window. Love it! Between the Magic Slide 2nd-Row Seats™ and One-Motion 60/40 Split 3rd-Row Magic Seat®, there are 15 different seating configurations. To take advantage of the Magic Slide 2nd-Row Seats™ however, you'll have to remove the middle seat of the 2nd row making the Honda Odyssey a seven seater (vs. 8 with all seats intact). To use the sliding 2nd-row seats, simply remove the middle seat of the second row so the outboard seats can slide to one side. You can also shift the seats forward a bit leaving an open space to access the third row seating (or storage if the seats are folded down). We liked being able to easily access gear in the trunk without taking bikes off the hitch-mounted bike rack! It's also nice if the kids want to sit together and play a game/read together on an iPad. When you want to move the seats back to their original positions, they easily slide and lock into place. The outboard seats are so far apart, little kids can't even reach even other - no more "Mom, she's touching me!" Camping gear for four including fishing gear, life jackets, and bike helmets. If you do a lot of road trips, a minivan is the way to go. You can bring all the things without stressing about whether or not everything will fit, or figuring out where things should go! It was such a treat to just toss stuff in and still have room to spare. We were finally able to bring all four camping chairs (as well as camping gear and mosquito bug screen house) AND fishing gear AND bikes AND stand-up paddleboards. Honda is known for its thoughtful storage and the Odyssey doesn't disappoint. Various nooks and crannies make it easy for everyone to keep their necessities closeby. 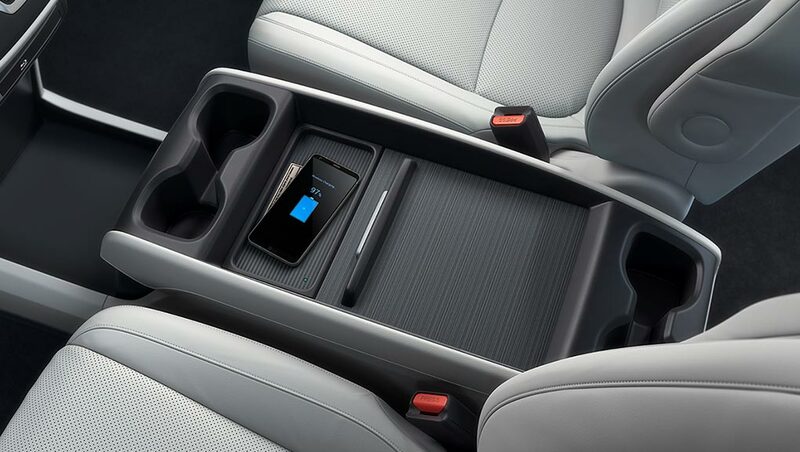 The cubby in front of the spacious centre console is perfect for a purse and has a lip on it so contents don't go sliding across the floor. A bag hook in the passenger side is perfect for a snack bag or trash bag. 15 drink holders means everyone can bring a drink and pack of Pringles! Storage cubbies in the second and third row are ample for mittens, sunglasses and small items like whistles and flashlights (or shells and pine cones if your kids are like mine). I didn't believe the kids when they said there was a vacuum in the back, but there is; tucked neatly into a side panel in the trunk. We made use of the HondaVAC™ in-car vacuum every trip because... kids. It's fun to make a mess AND clean it up when you're young. The Gen 5 Honda Odyssey Touring has an updated infotainment system with an 8-in touchscreen. It's easy to use; customize the menu by dragging and dropping apps just like on your phone. Speaking of phones, you can connect your cell phone via Bluetooth, Apple CarPlay, and Android Auto so you can receive messages and calls hands-free. Back seat passengers can watch movies on the 10.2-inch rear screen (Blu-Ray player included), track trip progress with the "How much farther?" app (no more asking "Are we there yet? "), or stream video via PBS Kids and Toon Goggles. For video streaming, tether your phone to use its data plan, or subscribe to a vehicle hotspot data plan (a trial package is included with new vehicles). 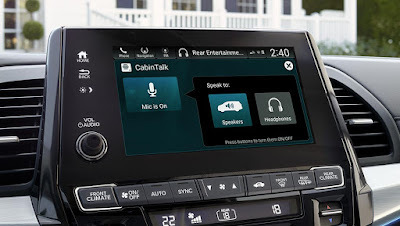 Two of the Honda Odyssey's coolest features are CabinWatch™ and CabinTalk™ . Select CabinWatch™ to turn on the wide-angle rear seat monitor so you can make sure everyone's buckled, and later see if the kids have fallen asleep so you can keep on driving. It works really well - even at night! If you need to chat with the munchkins mid-movie, turn on CabinTalk™ in-car P.A. to talk right into their wireless headphones (or plugged-in headphones; the 3rd row has headphone jacks). Sure beats shouting! I really missed CabinTalk™ as soon as we gave the van back! Control temperature via A/C button (instead of through touchscreen). This said, if there is a voice command for adjusting temperature, that would justify having controls on the infotainment system. A few more USB ports would be nice, especially since the van's capacity is 8 people. Currently, the Honda Odyssey has only 3 USB ports. Those sliding doors - really! We didn't have to worry about the kids flinging their doors open and hitting cars next to us. Plus, you can open the doors remotely and air out the car on a hot day! hands-free lift-activated liftgate with programmable height - wave your foot under the back bumper (with the key fob in your pocket) to open and close the liftgate! The 2018 Honda Odyssey Touring minivan is an amazing family roadtrip vehicle! We love how roomy and quiet it is, that it handles well on winding mountain roads and has good passing power and gas mileage, lots of safety features, and useful communication tools. It is easy to pack, adjust the second row seating, and stay connected. 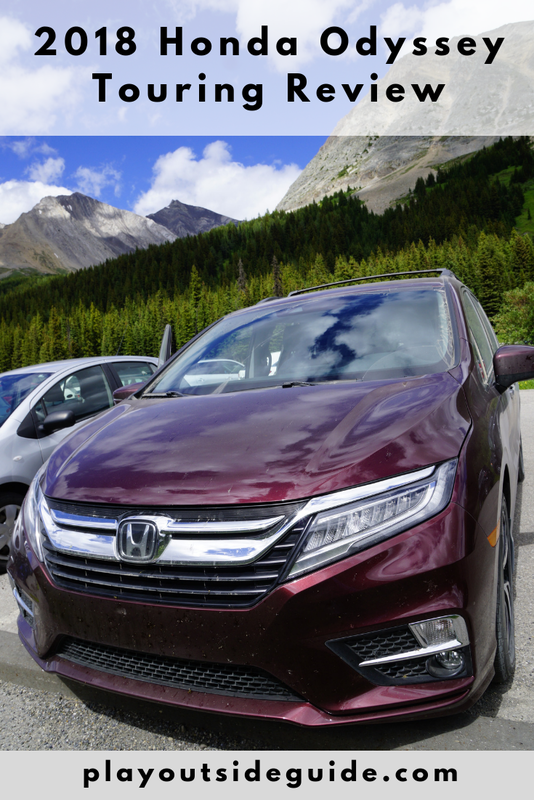 The Honda Odyssey passes all of our #playoutsideride requirements with the exception of 4WD, so we'd like to try it again in winter with the Snow Mode on to see how it does in snowy conditions. If you're looking for a larger family vehicle, take this minivan for a spin. 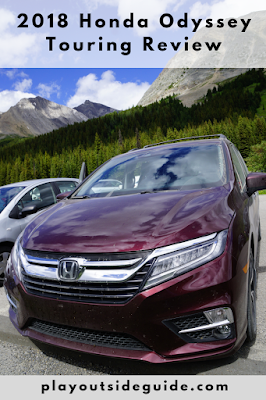 We favored SUVs until we tried the Honda Odyssey and now we don't know how we managed without all that cargo space! It's pretty nice being able to bring friends on trips too! 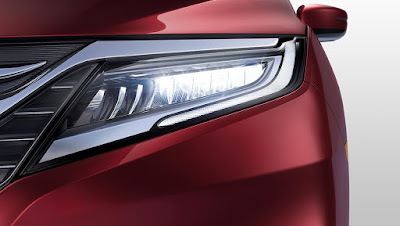 For more information on the Honda Odyssey including complete specs and pricing, please visit Honda Canada. 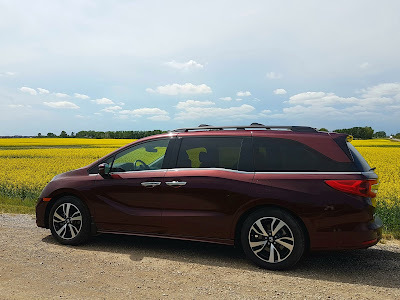 Honda Canada generously loaned us the 2018 Honda Odyssey Touring van to test and review. All words and opinions are my own.